Back in the late 1990s and early 2000s, there was a lot happening for me in terms of cultural politics. Hanson’s One Nation Party had reached the zenith of its popular appeal. The National Reconciliation process was winding down, and the Bridgewalks would draw hundreds of thousands onto the streets. Major protests were taking place at numerous remote detention centres around the country, like Woomera and Baxter. More often than not, my newer friends were from a web of young radicals, literary types, zinesters and musos in Brisbane. Under the Howard government, it was a serious but exciting time to develop an interest in politics. It is in this context that I began reading Ien Ang’s On Not Speaking Chinese and Ghassan Hage’s White Nation. These books introduced me to Feminist and multicultural theorists who were writing about cultural politics in ways that forced me to reconsider the very tenets of my own ethnic subjectivity. Most were engaged in ideas about ‘hybridity’ and ‘strategic essentialism’, releasing us ‘raced’ subjects from the strictures imposed upon us through mainstream culture. Some were beginning to utilise the phrase ‘Asian Australian’ as a way to define some of their scholarship. Since that time, quite a few of these scholars have become friends, but public discussions have been few. So even though I was a ring-in for the very busy Tim Soutphommasane, I knew the opportunity to participate in a public discussion with Ien Ang and Jacquie Lo (moderated by another hero of mine Annette Shun-Wah) about a document as significant as Labor’s Asian Century white paper, would simply be a privilege I couldn’t refuse. 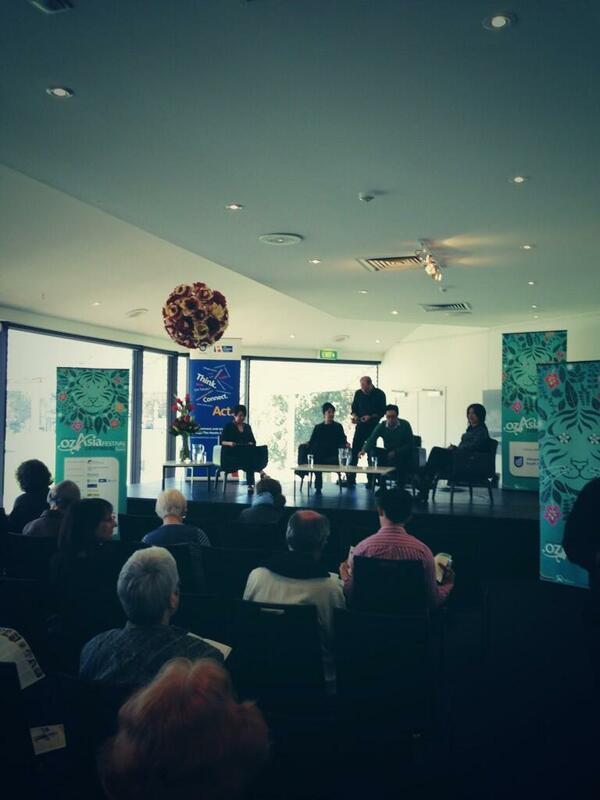 ‘The Role of Asian Australians in the debate about Australia’s place in the Asian century’ one of seven literary panels convened under OzAsia On Page. (L-R) Annette Shun-Wah, Jacqueline Lo, Jen Tsen Kwok, Ien Ang. The session I was on ‘The Role of Asian Australians in the Debate about Australia’s place in the Asian century’ was one of seven literary panels convened under OzAsia On Page between 21 and 22 September. I had the opportunity to see many of these talks, and especially enjoyed the ‘Asian Men Speak Out!’ panel with writer and composer Jerome Kugan, playwright Alfian Sa-at and the irrepressible Ben Law; the moving session with Carina Hoang about her book Boat People; and the whimsical ‘Food for Thought’ session with author Janet DeNeefe, chef Cheong Liew and Annette Shun Wah. Jacquie Lo spoke to the white paper first, and deliberated upon the absence of Asian Australians in the white paper as indicative of the absence of Asian Australians from Australia’s historical narrative, calling for a change in the public mindset to highlight our multitudinous histories of social, cultural and political enmeshment. I went next. Drawing from my PhD thesis, I talked about repositioning the white paper in terms of Cerny’s concept of the ‘competition state’. In other words, there is another dimension that government brings to the value of cultural diversity, looking at Asia through the lens of regional economic activity and trade. Underpinning this view is the increasing state logic of government as an ‘enterprise association’ (rather than a ‘civic association’) and I argued that this diminishes government’s interest in defending liberal democracy and political participation. Ien Ang closed out our panel, focusing upon differences between ‘Asia literacy’ and ‘Asia competency’. She talked about the need for a deeper appreciation of cultural difference, in terms of underpinning attitude and empathy, rather than technical knowledge. While acknowledging the significance of these terms to Australia’s economic future, she also drew a line under them as in some ways instrumentalist. We had some good questions. We had some silly and untenable ones. From the sensible ones, we talked about whether Australia was an Asian or British nation, but all of us thought we needed to get beyond that kind of rhetoric. Jacquie had some great ideas about our national consciousness being trapped in a dichotomy between opportunity and anxiety. The OzAsia Festival ran for much longer than the two days that I was there. Unfortunately the Moon Lantern event got rained out. But there was buzz about heaps of events including Jane Hutcheon’s lecture, performances by Malaysian singer-songwriter Yuna, shows such as Fight the Landlord, Poh’s Three Weddings and a Cook, Meeting with Bodhisattva, amongst others. But then again I got to see two incredible shows, with Performance 4A’s documentation of migration and change across the lifecycle, Stories Then and Now, and Alfian Sa’at’s award-winning meditation on racial politics in Malaysia, Parah (Instant Café Theatre). I also had quite a few cool serendipitous moments in Adelaide. 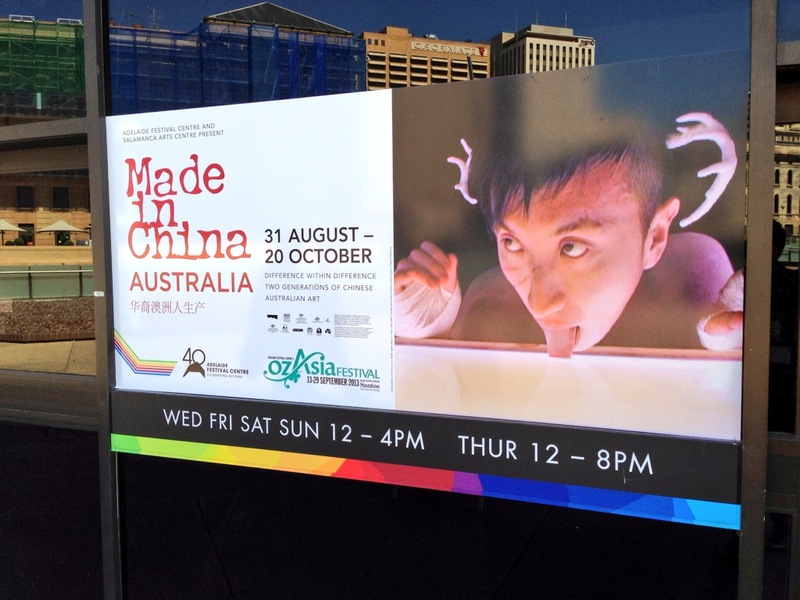 Wandering around the politically-charged Made in China exhibit with Ien Ang was one. Swapping stories with Annette about what it was like to grow up in suburban Brisbane over breakfast was another, as was being sat down by Stephanie, the gallery attendant at Tandanya Galleries, to talk about the Torres Strait Islander exhibit on reclaimed ‘ghost nets’. For someone with a very upfront interest in the connection between culture and politics, I got a pretty decent fix across just two days of events, and met some funny, brainy and diverse people in the process. OzAsia is the only festival of its kind in Australia, and it is a credit to its organisers and the City of Adelaide, that it goes from strength-to-strength.